Original Score composed by Hisayoshi Orura and gamesradar journalist Anthony Agnello. Remastered for Vinyl from archival Taito sources. In celebration of the 30th anniversary of the original arcade release, Ship to Shore PhonoCo. 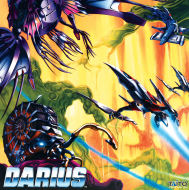 is proud to present the vinyl edition of Hisayoshi Ogura's score to Taito's Darius. One of the most heralded soundtracks in the expansive Zuntata canon, Darius sounds as fresh and innovative as it did when its sounds filled arcades back in 1987. Ogura's score combines pulsing rhythms with an experimental, avant-garde bent, giving Darius' high octane action a unique counterpoint. Housed in a gatefold jacket and featuring liner notes by both Ogura and GamesRadar.com writer Anthony Agnello, Darius is available on both red and blue vinyl.